The FormattingColorPicker is a color picker, which allows you to update the currently selected color of the content in the UI. 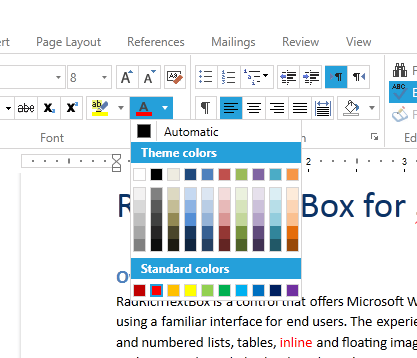 It tracks the current color of the document element to update the selected color accordingly and it is used in RadRichTextBox to apply fore color, highlight color and paragraph background color. To use FormattingColorPicker you will need to add a reference to the Telerik.Windows.Controls.RichTextBoxUI assembly. Example 1 demonstrates how to add the control to your XAML and bind it to a command. This property gets or sets the active color which is shown on the bottom part of the drop down button. It keeps the currently selected color and it is updated according to the position of the caret.